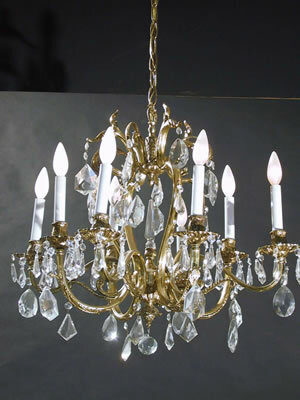 Circa 1940, this 8-arm Brass and Crystal Fixture has tear drop, diamond and spear shaped crystals. Floral castings are on the arms. A wonderful look for many rooms in your home. 41� length x 26� diameter Found a home in a Dining Room in La Jolla, California.